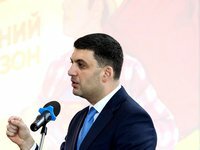 The results of the healthcare reform in Ukraine would be noticeable in full in two or three years, but today the government should be consistent in approving all the required decisions, Ukrainian Prime Minister Volodymyr Groysman has said. According to a posting on the official website of the Ukrainian government, the prime minister said that actin Health Minister Ulana Suprun is able to break schemes used for years in the healthcare sphere. "Medicine did not know changes since the last century. It has been brought to ruins. Ulana Suprun started reform to change this. She is a volunteer who came here to work. She has a tricky character, but she is able to break schemes created in this sphere," Groysman said. He believes that all myths regarding transformations imposed, especially in the sphere of the new medicine procurement tool, are mainly manipulations. "Now we procure medicines, which are produced for Ukraine in advance. This is global practice. Now everything is being systematized. For example, first in seven years Ukraine has vaccines required for immunological prophylaxis in line with the vaccine schedule in the full amount," the prime minister said. He said that the procurement is centralized, via UN, international tenders, which is impossible to interfere. "To try to steal something there, you have to be crazy as a coot!.. Now there are attempts to impose "own" minister, introduce new corruption schemes through him - and again all the rounds. And I want to change the healthcare system," prime minister said. "And the process has already started, already 9 million Ukrainians have concluded agreements with family doctors, but in two or three years you will see the result, but you need to be consistent. You cannot go from one extreme to the other," Groysman said.